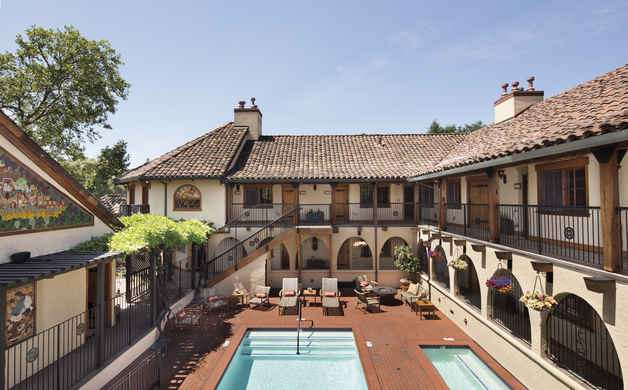 It has been two years since Napa’s artisanal Rancho Caymus Inn closed its doors for a complete remodel, and during this time adoring fans of the historic boutique hotel have waited patiently for the reveal. Would original founder Mary Tilden Morton's vision be compromised? What would become of her collected Ecuadorian artifacts? What about the beautiful commissioned stained glass windows – would they remain? The Inn’s recent reopening reveals a deep respect for Morton’s original aesthetic, though new owner George Altamura Jr. has greatly increased the Inn’s luxe quotient. Longtime guests will experience the same warm hospitality they knew and loved, but the vibe is now elevated. New guests will wonder why they ever stayed anywhere else in the Valley. 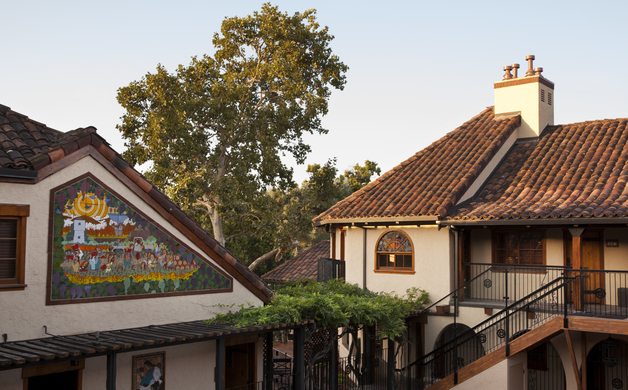 Nestled in the tiny hamlet of Rutherford, off of Highway 29, Rancho Caymus Inn is, and always has been, a hidden gem. Designed and opened more than 30 years ago by the late vintner, designer, pilot, and renaissance woman Morton, (of Berkeley’s Tilden Park and Morton Salt families) the original Inn was her paean to Spanish romanticism. She painstakingly gathered and collected the authentic materials, furnishings, and artwork that filled the gracious hacienda’s 26 rooms. The inn became a living showplace for the artists and craftspeople who created it, and Altamura has ensured that in its current incarnation it remains so. The inn’s original hand hewn solid oak doors, California black walnut countertops and beams, and fir and white oak reclaimed from a 19th century Ohio barn all remain intact. The nine original stained glass windows by acclaimed artist Gaye Frisk remain, and are displayed in the hotel’s premium suites. Original hand woven and dyed pillow covers and bedding—crafted by the Salazaca and Otavalon Indians of Ecuador and hand-selected by Morton from an Ecuadorian marketplace—have been memorialized as beautiful wall hangings in each and every guest suite. And a spectacular 1987 ceramic tile mural (aptly entitled ‘Grape Harvest’) by world-renowned mosaic artist Guillermo Wagner Granizo overlooks the new central courtyard pool and terrace area. But while much of the original remains, much has changed. The Inn now exudes casual elegance and a refined aesthetic that is charming, romantic, and luxuriously intimate. 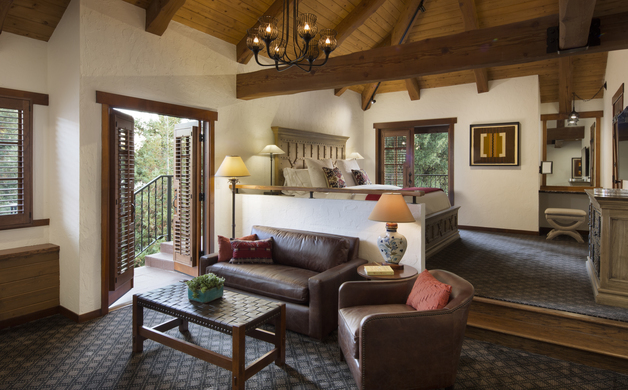 Rooms and suites are spacious and sumptuous with heritage wood ceilings, fireplaces, living areas, private patios, and Restoration Hardware and Frontgate custom furnishings in the hacienda style. Sparkling white subway-tiled bathrooms feature all natural Tarocco custom toiletries in a delicious Sicilian Blood Orange scent (packaged in a Rancho Caymus Inn logoed toiletry bag – yours to keep.) Beds and linens are lofty and plush. Robes and slippers are at the ready. Enjoy complimentary evening wine tasting Thursday, Friday, and Saturday evenings, and a bountiful complimentary daily breakfast buffet featuring, among a number of delicious items, baked goods from Napa’s beloved Model Bakery and Equator coffee. 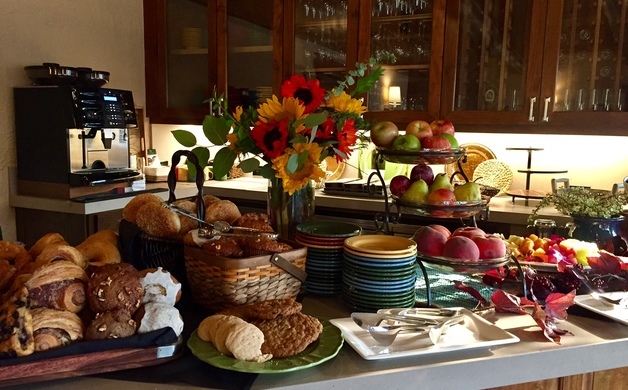 The kitchen also serves snack and meal items that can be enjoyed poolside, in-room, or in the small dining area. 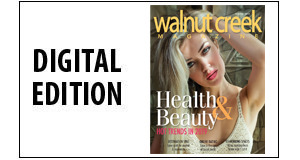 But two defining aspects of a Rancho Caymus Inn stay are proximity and walkability. Several wine tasting rooms and a popular Napa restaurant are within strolling distance, allowing guests to further relax, unwind, and fully enjoy the rewards of a Napa Valley vacation. 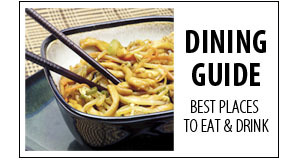 Why stay anywhere else indeed?